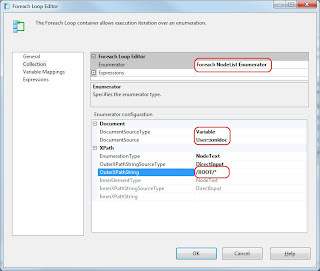 I want a Foreach Folder Enumerator, but the Foreach Loop component only loops through files. - Use a Script task to accomplish this. 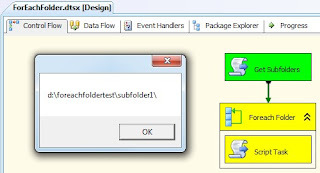 This example uses the Script task and a Foreach Loop to enumerate through the folders. The Script tasks generates a list of Directories and the Foreach Loop loops through that list. Drag a Script task and a Foreach Loop container to the Control Flow like the image below. startlocation that indicates the parent folder wherein we gonna search for subfolders. Fill it with a path like "d:\foreachfoldertest\". xmldoc which we gonna use for communicating between the Script task and the Foreach Loop. folder which is used for the variable mapping in the Foreach Loop container. Select the startlocation as a readonly variable (we only read the path inside it) and select xmldoc as a readwritevariable (an xml string will be stored in it). 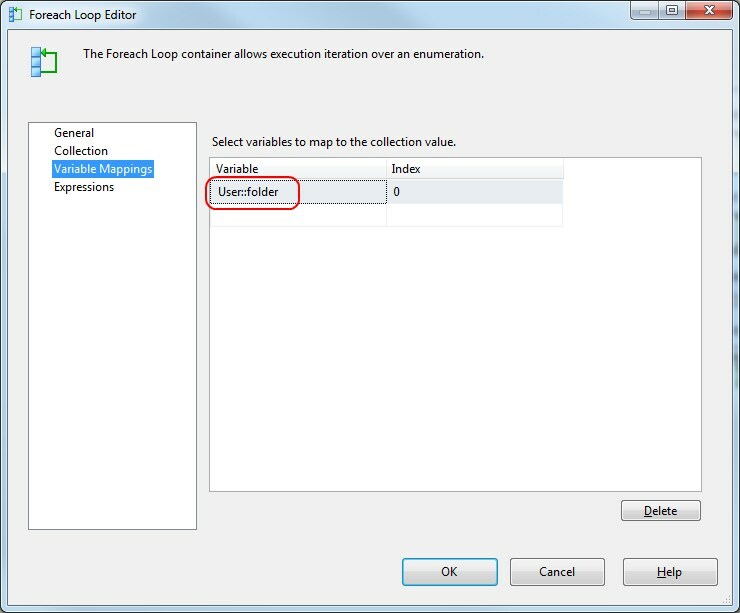 Edit the Foreach Loop Container and change the enumerator on the Collection tab to Foreach NodeList Enumerator. This means that it will loop through an xml string. Change the DocumentSourceType to Variable and select the xmldoc variable as the DocumentSource. 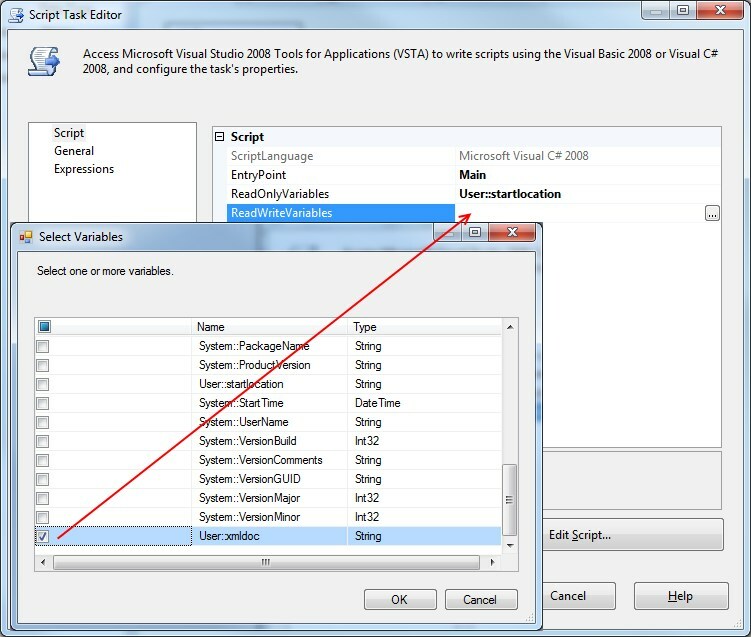 This is the variable that contains the xml string from the Script task. Last... add the following string to the OuterXPathString: "/ROOT/*" (without the quotes). This means that it's gonna look within the root element. 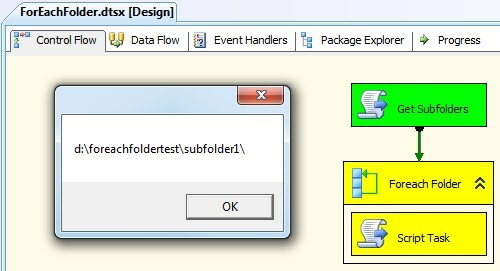 Map the variable folder to Index 0. This will store the path in this variable. Now you can add your own tasks to the Foreach Loop container and use the variable folder to get the path. I added a simple Script Task for testing that shows the path in a MessageBox. 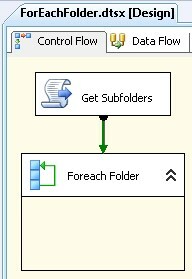 You can even add a Traverse subfolders option with this recursive method. 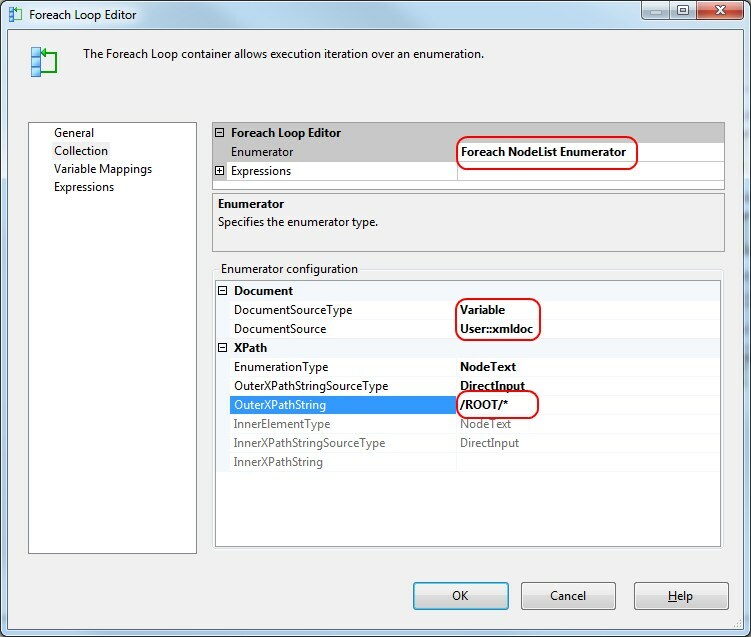 Note: there are more options to accomplish the communication between the Script Task and the Foreach Loop container, but I wanted you to show an infrequently used option of the Foreach Loop container. Let me know what your solution was. Thanks bro. Helped a ton. 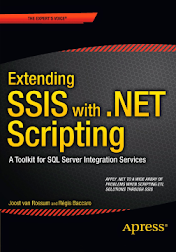 Hey thanks for your article actually I am very new to SSIS ad tryig to learn this . Error: Failed to lock variable "User::startloaction" for read access with error 0xC0010001 "The variable cannot be found. This occurs when an attempt is made to retrieve a variable from the Variables collection on a container during execution of the package, and the variable is not there. 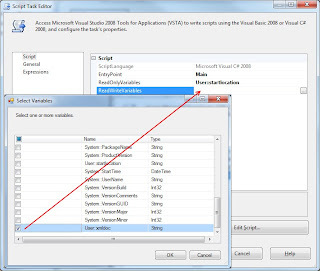 The variable name may have changed or the variable is not being created.". I am using 2008 version, i don't have permissions to install custom enumerator. Error: 0xC0014023 at For Each Folder: The GetEnumerator method of the ForEach Enumerator has failed with error 0x80131943 "(null)". 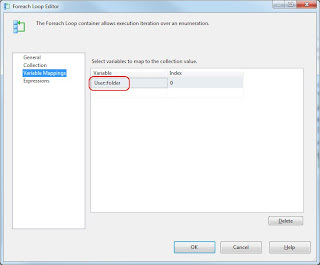 This occurs when the ForEach Enumerator cannot enumerate. Cracking piece of code but unfortunately I have no experience with C# so debugging is difficult. Cannot load script for execution. I have also tried to install the custom component but unfortunately after installation i cannot see the changes to my ForEach Loop Component. Which version of SSIS are you using and which script did you use? 4 or 8? Did you copy the contents of the method or did you copy the whole script? Do not copy the whole script, but only the missing usings and then the contents of the Main method. Worked very well for me in 2008 - thanks! Is XML really necessary? Can't you just use an array or a list and make the variable type an object? For loop does have the option for looping a variable. No! It just one of the possible solutions... you could also store a datatable in an object variable and then use a foreach ado enumerator... and there are even more possibilities. facing similar issue ssdt -2014. can you suggest me a solution ? @Chaithanya Reddy Cheruku26: Please be more specific. Or contact me via the webform in the menu. Thanks. This works very well for all folders. How do I exclude some folders. Just a view and always the same? You could add a simple if statement within the loop. Hi Joost, Can you please help me how to exclude several folders with the loop? I have tried and still not working. Thanks. Please use the SSIS MSDN forum for general SSIS questions that are not about this post. I'm a regular reader of that forum and will gladly answer those questions over there. All comments are moderated manually to prevent spam. The process cannot acces the file 'ssisproject.ispac' because it is being used by another process.